Serving as a District Leader is a great responsibility, but an exciting opportunity to further develop your communication and leadership skills. The District Leadership Committee (DLC) is seeking Nominations for the roles of Division Director, Club Growth Director, Programme Quality Director and District Director. Full details can be found on the D91 website. Submissions should be made to Leadership Committee Chair, Pedro Casillas DTM . The deadline for candidates to declare intent to run is Friday 14 December 2018. After this date, the DLC will contact candidates to arrange interviews and will seek out other candidates as appropriate. The final report of the DLC will be circulated to District Council members by 6 April 2019, 4 weeks prior to the District Council meeting on 4th May 2019, when voting will take place. After a warm welcome from Lark Doley, CEO Dan Rex reviewed the 4 core values of: Integrity, Respect, Service and Excellence and said that, ‘Good things happen when we follow the core values’. 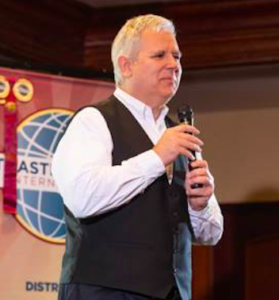 Dan then challenged all Toastmasters to a 5-year challenge using the Core values: The challenge: ‘during the next 5 years, what will you have done to the benefit of yourself and other members?’ I’ll be taking up this challenge – how about you? Then Margaret Page, 2nd Vice President, asked us all to think about ‘what is your why?’ Why are you attending Toastmasters and what are your goals? She then challenged us to share our goals within our clubs. Margaret also suggested that we might like to create a 1 min video and share, “#My Why” (https://www.toastmasters.org/MyWhy) – (tagging Toastmasters International and @ToastmastersUKI or share with us to upload to Toastmasters District 91 UK South YouTube channel).